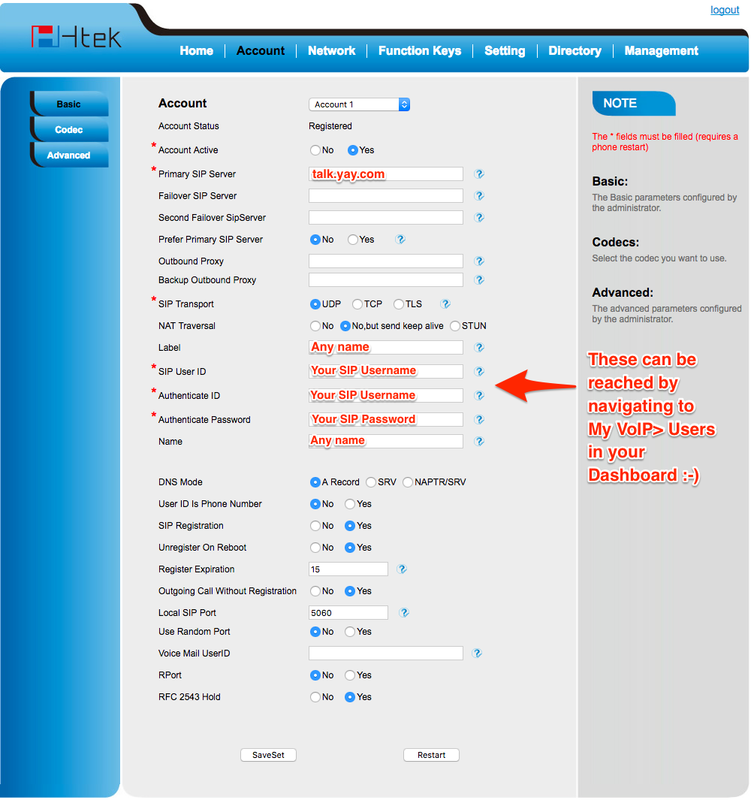 Home > VoIP Support FAQ > VoIP Phones > How do I set up a Htek series IP phone? How do I set up a Htek series IP phone? To setup your VoIP account on your phone you will need your SIP details: <your_SIP_username>, <your_password>and host talk.yay.com. This information can be found in your dashboard under Users. In order to configure your Htek phone, you will first need to determine what the IP address for the phone is, so that you can access it from a web browser. You can access your phone’s IP address by navigating to Menu > Status > Information and copying the ‘IPV4’ section, bullet points and all! Alternatively, you can use networking scanning utilities that will scan your network and list all the devices and their IP’s available for you to use. There are two network scanners that we recommend depending on whether you are Windows or Mac OS. Both are free. Once you have determined your IP Address, open a new browser window and place this IP into your browser and you will get the Htek Web Interface. Then, simply enter your SIP user details as shown below!